We get it: going to your first tournament can be scary. There’s a lot of pressure on a newer fencer to perform and prove to themselves that it’s worth continuing to travel and fence. On top of performance pressure, there are a lot of rules and small details you’ll have trouble picking up on before you get there. We’re here to help alleviate your stress. In this guide, we give a barebones description of everything you should expect going into your first few tournaments, including an overview of rankings, how to know whether you’ll get points, and a few general rules for qualification. How are fencers ranked in US? Fencers are ranked within their points standings by the number of points they have. The fencers with the most points are the highest ranked. These rankings determine who is the best of the best in the USA within their particular category. Fencers earn points by traveling to national or international tournaments and performing well - the higher a fencer finishes, the more points they’ll get for that tournament. We’ll be discussing how to qualify for national tournaments, and what to expect when you go to a youth, cadet, junior, or senior national tournament. In a subsequent article we will talk in more detail about the regional, veterans and wheelchair paths to National Rankings in those events, as well as letter ratings and how to earn them. What are the US points standings categories? USA Fencing maintains a few different point standings*, so even those fencers that are not (yet!) Olympic caliber are able to compete against one another. These standings rank fencers according to their region. There are six regions in fencing that split the continental US relatively evenly. Regions are sometimes referred to as sections. Regional points can also qualify a fencer to participate in national tournaments. These standings are identical to the regional youth tournaments, except they are for adult fencers and have a different name. These points determine who is the best fencer in the country for each category at any given time. This is a culmination of a fencer’s best scores in national and international events. These points determine who has the most points towards participating in World Championships. Check out this article if you’re interested in learning how a fencer qualifies for World Championships. 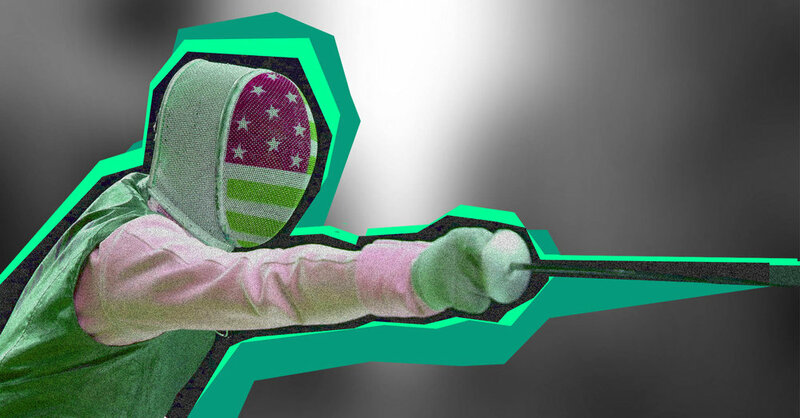 How does a US fencer get national points? US Fencers get national points when they go to various tournaments across the US and to World Cups that have been designated as points tournaments by the USFA. To earn points at a national event or international event, a fencer must finish above a certain threshold. This threshold is based on the number of fencers competing at a tournament, but a good rule of thumb is that a fencer will score points if they finish in the top 64 of the fencers that attended that particular tournament. However, if the tournament is not well attended by other competitors, fencers may need to advance farther in the tournament in order to earn points. You can read more about the specifics for earning points in the Athlete's Handbook. Note that national rankings are not the same as national ratings which are the letter values (A through E as well as U which stands for unrated) assigned to fencers based on results at designated tournaments. These ratings help seed fencers with no points or at tournaments where points are not used for seeding. There are some events that are specifically rating-based. These events are the Division IA, Division II, Division III, and team events, and are great for earning national letter ratings. These events can also qualify a fencer for other national events where appropriate, but do not earn a fencer national points. You can read the specifics of how a fencer earns letter ratings here. USA Fencing restricts many events by age. These restrictions are based on birth year. These include Y10, Y12, Y14, Cadet, Junior, Senior/Division 1, and Veterans (not covered here). Below is a breakdown of the various tournaments for each of these age categories. Keep in mind that the age cutoffs for this season can be found in the Athletes Handbook. These tournaments are restricted by age. Y10 is for fencers 10 and under, Y12 is for fencers 12 and under, and Y14 is for fencers 14 and under. The specific age rules are also in the USFA Athlete Handbook. It is important to note that age eligibility changes with the tournament season rather than the calendar year. Below is a rundown of the various tournaments throughout the year so you have a sense for your options in terms of competing. For specifics on how to qualify, it’s best to check the Athletes Handbook. A youth NAC (North American Cup) is a tournament where the top youth fencers in the US get together and compete to see who is the best for their age category. Generally these NACs will be filled with parents and friends when compared to tournaments in older age categories. It is not unusual for a fencer to compete in multiple events, whether across age categories or across weapons! Qualifying for a youth NAC is easier than you might think. The specifics can change from year to year, but generally they require participating in a local tournament or two, and getting a few regional or national points. Youth Nationals is pretty much the same tournament as a youth NAC, except the winners of each event can claim the title of national champion, so tensions can be a little higher. The qualification paths are also a little more strict - but if you’ve been to a youth NAC, you should pretty much know what to expect at Nationals. Qualifying for youth Nationals is usually a little harder than a youth NAC. Competitors might have to go to specific qualification events or already have national points in order to compete. Additionally, a fencer must be a US citizen or permanent resident to compete at National Championships. These tournaments are restricted by age. Cadets are under 17 and Juniors is 20 and under. The specific age rules are in the USFA Athlete Handbook. Again, people ‘age out’ of an event after a fencing season ends rather than the calendar year. Cadet and Junior tournaments usually have slightly higher stakes than youth events. The best fencers in each of these events will start traveling internationally to world cups and competing for the chance to participate at World Championships. You’ll start to see fewer parents at these events (although many parents still travel), and the tournaments start to become a little more intense. The specifics can change from year to year, but if a fencer is considered too young (see USFA athlete Handbook), they often need to demonstrate that they are capable of competing by being on the national points standings for the category below the one they would like to compete in. This is essentially the National Championship event for the Cadet and Junior team points. It’s also the tournament that can make or break a fencer’s chance to qualify for World Championships. For these reasons, it is usually the most competitive and intense tournament of the year for a Cadet or Junior fencer. Qualifying for JOs is a little tougher than qualifying for a NAC. You’ll need some national points from one of the various NACs you’ve gone to, or a number of regional points to qualify. There are also various qualifying events that you can attend in your division. Asking your coach or club official is a good way of finding these qualifying events. This is the first event of the Cadet/Junior National Team qualifying season. Since most serious fencers will be winding down from last season, the July Challenge is probably one of the more relaxed tournaments of the year. It’s not unusual for a top fencer or two to skip this tournament entirely. Note that birth year qualification has changed to one year younger than it was at JO’s so many fencers are “rolled” or “aged out” after JOs. Just like JOs, qualifying for the July Challenge is a little tougher than qualifying for a NAC. You’ll need some national points from one of the various NACs you’ve gone to, or a number of regional points to qualify. There are also various qualifying events that you can attend in your division. Asking your coach or club official is a good way of finding these qualifying events. The USFA participates in the Cadet and Junior World Championships and sends a team every year. This tournament occurs in the Spring, where the US sends the best of the best to compete. Since we’ve already gone over Cadet and Junior worlds in detail, we won’t cover it here. Read our article on how to qualify for world championships if you’re hankering to learn more. Division 1 tournaments are for the best fencers in the US. The highest ranking fencers in these competitions compete at World Championships, the most competitive event in the world. Every four years, these fencers also fight to compete in the Olympics (which takes the place of World Championships). Division 1 tournament points do count towards Cadet and Junior National rolling and team point standings, which means many top Cadets and Juniors will be fighting for scores in Division 1 as well. Division 1 NACs are the highest echelon of US fencing. The best fencers in the country in each weapon will come and compete. There will be fewer parents at these events than others, since many fencers will be in college or graduated and working. Fencers often qualify for NACs by achieving a specific rating at local or regional events. At the time of writing this article, a fencer must be 13 years or older, and have a ‘C’ rating. It’s also possible for younger fencers to qualify if they have enough points, but it’s extremely rare. Division 1 National Championships, for most events, is pretty much just another NAC. World Championships at this level is determined more by international results than national results, so it’s less common that fencers will be fighting for their spot on the World Championship team during National Championships. The best way to qualify for this event is to get Division 1 points at a NAC. There are a couple other ways to qualify for fencers who excel in younger events, as well as specific tournaments that will qualify a fencer for Nationals, but it is rare that those fencers will not also have Division 1 points. This is the first event of the year for Division 1 fencers. Since most serious fencers will be winding down from last season, the July Challenge is probably one of the more relaxed tournaments of the year. The July Challenge Division 1 tournament counts as rolling only for many weapons. It’s not unusual for a number of top fencers to skip this tournament entirely. This is the first event of the Senior National Team qualifying season. The qualification for the July Challenge is similar to Division 1 Nationals: points from a NAC is the best way to qualify. However, the July challenge is a little bit more lenient on how many Cadets, Juniors, and so on can qualify than Nationals. How to qualify for NCAA’s is outside the scope of this article. If you’re interested in learning more about NCAA fencing, check out our complete guide to NCAA fencing. NCAA championships often pits National Team members against each other and provides top flight competition. This concludes our article on how to qualify for national tournaments and start earning those national points. Hopefully this helps clarify how to jump into the world of competing in fencing at a national level! We didn’t go over how to get on the regional points standings, the Division II point standings, how to qualify for Division 1a at Nationals, or how to get national ratings (A-E) for the sake of brevity. Keep an eye out for that in a subsequent article! *USA Fencing maintains Wheelchair National Point Standings. These points determine who is the best fencer in the country for the wheelchair event. These points can also qualify a fencer to participate in the IWAS World Championships.